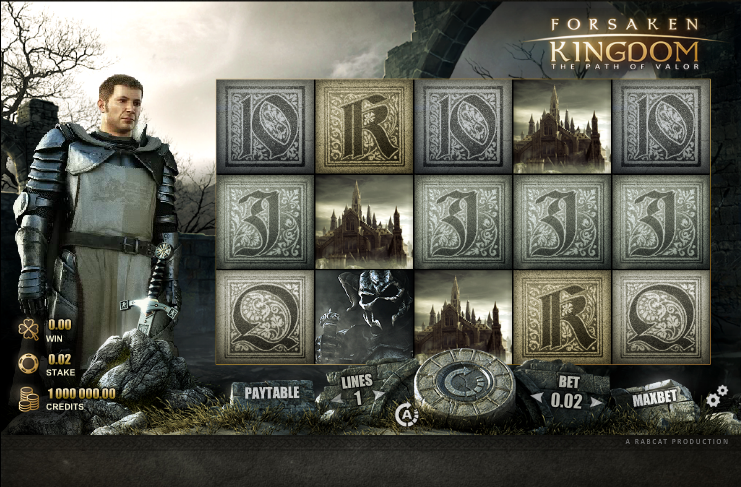 King Arthur and the Knights of the Round Table offer plenty of scope for online slots developers and we’ve reviewed a fair few such games in our time. Of course there’s always room for one more and this time it’s Rabat Gaming who’ve joined the legendary party with Forsaken Kingdom – The Path Of Valor, to give it it’s full title. 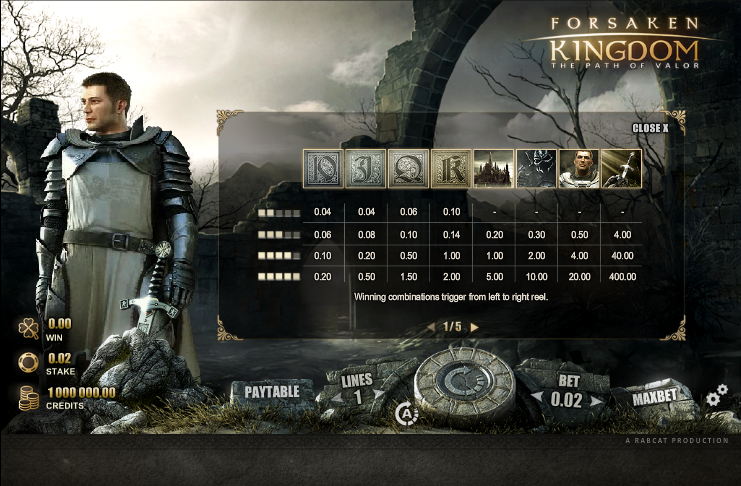 Forsaken Kingdom is a five reel slot with three rows and up to twenty paylines and we always like a game which revels in the gloom and misery of mediaeval life. An animated King Arthur himself stands to the left of the reels in front of a dark brooding sky, ruins and sparse trees. The four high value symbols are The Sword In The Stone, King Arthur, the Black Knight and Camelot; 10, J, Q and K are the ornate lower values. Lady Guinevere is the wild symbol and appears only on reel three, expanding to fill all positions if a winning combo is possible. The shield is the scatter which activates two bonus features. Around the ‘Spin’ button you will see twelve positions which indicate the places on the round table. Each time you land two shield symbols on the reels one of these spaces will be filled – fill them all and you will be taken to a screen displaying the Round Table with each position marked by a multiplier. The table will spin and when it stops you’ll be awarded the value shown multiplied by your total stake. This bonus is triggered by landing three or more of the shield symbols anywhere in view; King Arthur will now pull the sword from the stone in front of him to reveal between five and twelve spins. There’s no multiplier for your wins here but the spins can be re-triggered. Land King Arthur next to the Black Knight on the top row for an instant win. Land King Arthur next to the Lady Guinevere on the top row for an instant win. This is a top quality game with some superb gloomy graphics and great sound effects including King Arthur cheering every time you land a decent win. Lots of bonus features including the Round Table Of Fortune guaranteed win mean this is well worth checking out.